Or rather, just what is Danny Cipriani getting himself into? And I'm not talking about Alexandra Burke or his incredibly newsworthy attempts to get into a friend's Lamborghini (don't ask). No, what I'm wondering is what sort of outfit Cipriani's new team, the Melbourne Rebels, are likely to be. 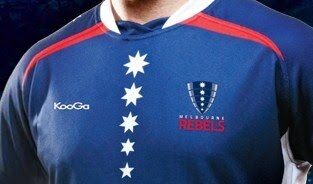 Being a brand new franchise the Rebels have, naturally, launched a new kit - a fairly unremarkable blue (Victorian blue, apparently) ensemble with five stars running down the middle of the chest, supposedly each star representing the team's player pledge. Do you see what they've done there? 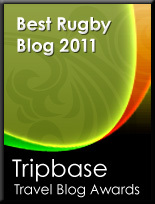 How could any self-respecting rugby player fail to be inspired by that?